Dancing is so essential to Greek culture that there may never have been such a thing as a Greek celebration–certainly not a Greek wedding–without it. If you’re Greek you’ve likely been dancing with your friends and relatives (and anyone who will dance with you) since birth, expressing your joy and sadness and all in between by gliding or stomping or twirling around the room, often in time with rhythms that would cause most of us to tumble. Most traditional Greek dances are circle dances in which dancers hold hands, wrists or shoulders, or link to one another by both holding a handkerchief. Usually men lead dances, and while dancers in the circle can be of either gender, sometimes men break off into an outer circle that surrounds an inner circle of female dancers. In some regions there is a prescribed order of dancers; men are first in a line, in descending order of age, then come women in a similar order. The oldest member of the village will lead the dance. Elsewhere the circle is composed of the group of families; the husband leads the wife, then the eldest son, his wife and then their children. There are a seemingly infinite number of distinct Greek dances–Wikipedia’s entry on “Greek dance” lists links to a couple hundred, and mentions that there are at least four thousand. The United Kingdom’s Nostos Hellenic Information Society’s introduction to Greek dance helps us make sense of this by offering a summary, region by region. Let’s take a tour of Greek dance, and in the process a tour of Greece itself, by summarizing that summary, adding some links to the dances from YouTube so we can see what the Nostos summaries mean. 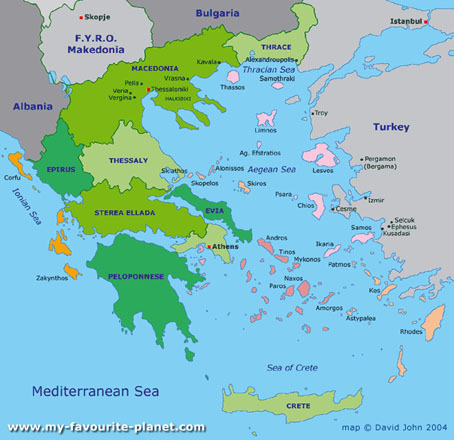 There are six regions on the Greek mainland (Epirus, Macedonia, Thrace, Thessaly, Central Greece and Peloponnesus) and three main groups of islands (Ionian to the west, Aegean to the east and the Dodecanese in the southwest). The largest Greek island is Crete, which is south of the mainland. This map will help you follow along. Epirus, which joined the Greek nation in 1913, is rugged and mountainous, causing villagers to wear heavy boots, leading to the traditional dances becoming slow, heavy and danced with great dignity. Watch the Kostilata dance from Eprius. Macedonia, which joined Greece in 1913, is a mountainous region in Greece’s north, sharing a long border, and much culture, with neighboring nations of the Balkans. Watch the Florina dance from Greek Macedonia. Thessaly is primarily a fertile plain that became part of Greece in 1881. Often in Thessaly dancers sing along with the music, often without instrumental accompaniments. These song-dances are slower than other Greek dances and dancers dance with precision. Watch dancing from Gardiki from the Asporopatomos region of Thessaly. Roumeli is not a region named in our map, but is essentially found in north-central Greece. Roumelian dances are generally controlled and slow. Watch the Tsamikos dance, popular in Roumelian Greece. The struggle to free Greece from the Ottoman Empire began in Peloponnesus in 1921. Enjoy a Greek family’s Peloponnesian song and dance. The music of the Aegean Islands is springy and lyrical; the dances of the Aegean Islands are bouncy and light. Watch a Ballos dance from Naxos in the Aegean. The seven Ionian islands were united with Greece in 1864 but have long been under the influence of Italy. Dances in the Ionian islands are graceful and full of much humor. Watch the Ionian Zervos dance. Crete became part of Greece in 1913. Cretan music and dance are fast and dynamic, full of springing movements, with dances often giving the opportunity for dancers to demonstrate their abilities by improvising. Watch some dynamic Cretan dance (the dancing starts at about 0:35). In class we’re going to dance to “Milo Mou Kokkino,” and do a step known as the kalamatiano. Want to learn how to do the dance? Here is a written guide, but you may get a better idea of how to do the dance by watching these folks.